Situated just under 2km from Oranmore village, Gort an Dúin has a lot going for it. 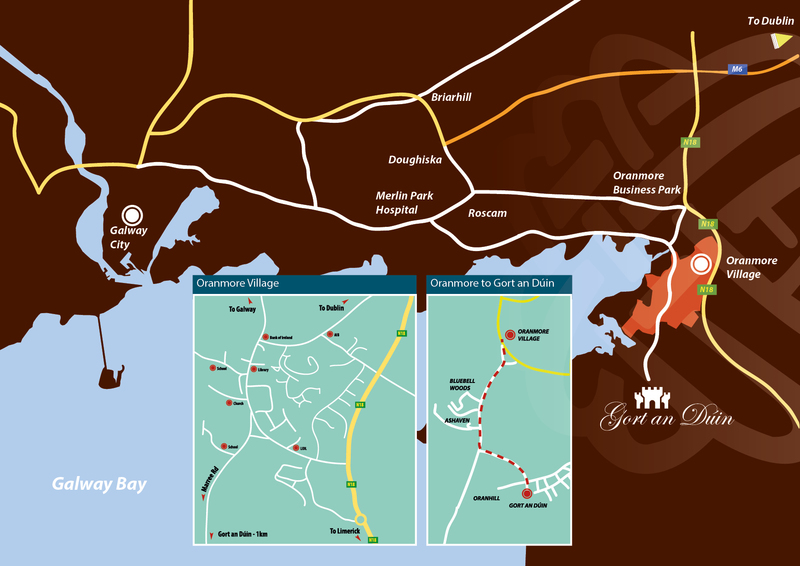 Oranmore continues to be a highly strategic location and is within striking distance of all major urban areas. It is within easy commutable distance of Athlone and Limerick and is serviced by a rapidly improving road network and an excellent public transport system. Oranmore really is the best of both worlds; rural and suburban, historic and modern! A 10 minute drive from Galway city, it is at the crossroads of all major driving routes; Sligo, Dublin and Shannon/Limerick. With an estimated population of over 7,000 residents, a variety of employment opportunities, four national schools and one secondary school, Oranmore truly is a wonderful place to live. Along with being a great location for schools, shopping and long country walks there are a host of local sports clubs which include, judo, sailing, men and women’s GAA, badminton, basketball and golf utilising the spectacular setting of Galway Bay Golf Resort located in Renville, Oranmore. Whatever your tastes you will find a strong and welcoming community spirit in Oranmore. Oranmore railway station originally opened in 1851, but reopened in July 2013. Trains connect directly with Galway, Athenry, Athlone, Portarlington, Kildare and Dublin, as well as on the Western Rail Corridor to Ennis and Limerick. You have easy access to the M6 motorway and M18 Galway/Limerick motorway is currently under construction. Oranmore is also serviced by a regular bus service to Galway. Thank you for your interest in this development.